Jakarta: A strong 6.8 magnitude earthquake rocked eastern Indonesia on Friday, the United States Geological Survey said, triggering a tsunami warning and sending panicked residents fleeing from their homes. The quake struck at a relatively shallow depth of 17 kilometres (10 miles) off the east coast of Sulawesi island, the USGS said, where a 7.5-magnitude quake-tsunami around the city of Palu killed more than 4,300 people last year. The warning was later lifted by the agency, which had estimated the wave at under a half a metre (20 inches). 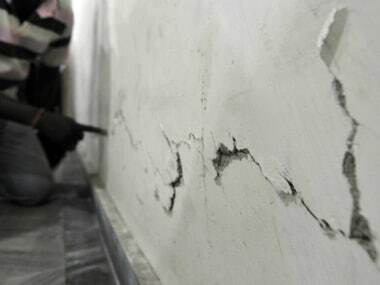 It was not immediately clear how much damage was caused by the quake or if there were any casualties. Hapsah Abdul Madjid, who lives in Luwuk city in Banggai district, Central Sulawesi, where the tremor was felt strongly, said people fled to higher ground and the electricity was cut, adding that residents panicked as fears soared over an imminent tsunami. “I ran straight outside after the earthquake — everything was swaying,” 29-year-old Palu resident Mahfuzah told AFP. Thousands in Palu were still living in makeshift shelters six months after the late September disaster with at least 170,000 residents of the city and surrounding districts displaced and entire neighbourhoods still in ruins, despite life returning to normal in other areas of the tsunami-struck city. The force of the quake saw entire neighbourhoods levelled by liquefaction — a process where the ground starts behaving like a liquid and swallows up the earth like quicksand. Last year was a particularly tough one, however, with more than 2,500 disasters ranging from a series of deadly earthquakes to killer landslides and volcanic eruptions. The sprawling archipelago is dotted with more than 100 volcanoes, including one in the middle of the Sunda Strait between Java and Sumatra islands that erupted in late 2018 and unleashed a tsunami that killed more than 400 people.